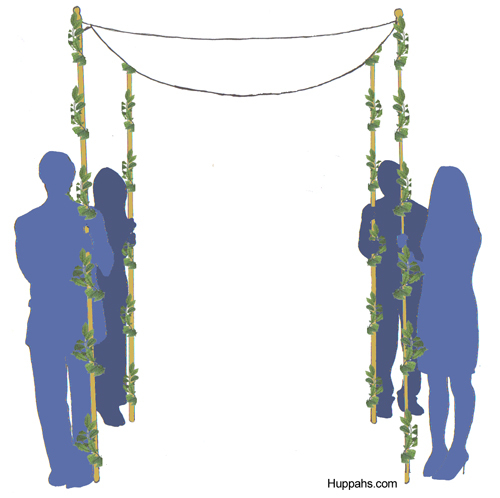 Add color and movement to your huppah with long ribbons that catch the breeze. Ribbons make simple and inexpensive wedding decorations. You can keep the look simple with one color, or combine ribbons in all the colors of your wedding to draw the huppah into the rest of your wedding décor. 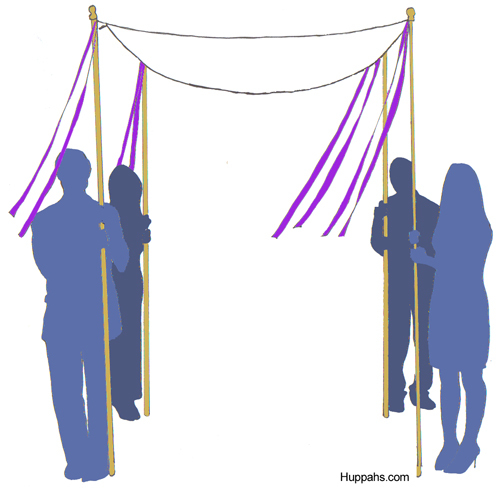 To create the best effect, ribbons should hang down one-half to two-thirds the length of the huppah poles. And rather than matching up the ends of the ribbons, vary their lengths by a half inch or so to encourage them to move independently of each other. Take a look at the joyous combination of ribbon colors that Barbara Hoffman of Maryland chose for her daughter’s Simplicity Huppah earlier this month. Each pole was tied with three ribbons chosen from a palette of orange, baby blue, ivory, pink, white, and apple green.